A recent ‘State of the Nation’ survey indicates that, for the most part, people believe health and safety in New Zealand is improving – recent tragedies aside. However, managing contractors remains a widespread concern, with around a quarter (23.8 percent) of the nearly 800 respondents in the annual Safeguard survey identifying this as their main health and safety challenge for the next 12 months. Our MD Hamish Howard discusses how contractor management in the new health and safety environment needn’t be a sore point. The law is now very clear that putting work out to contract doesn’t exempt you from meeting health and safety obligations. Effective contractor and supply chain management is one of the key parts of the Health and Safety at Work Act 2015. Businesses or PCBUs are now expected to consult, cooperate and coordinate with each other on overlapping health and safety duties – it is no longer a simple ‘tick box’ exercise. Our clients are already reporting an increased focus by Worksafe on this obligation, in the form of questions being asked by onsite inspectors. Under the legislation, PCBU means a person conducting a business or undertaking: whether the person conducts a business or undertaking alone or with others; and whether or not the business or undertaking is conducted for profit or gain. This comes at a time when some of the country’s leading commercial construction companies have signed a new agreement to remove inconsistent approaches to health and safety between sites. The initiative, aimed at new entrants and subcontractors, has the backing of major players including Arrow International, Fletcher Construction, Hawkins Construction, Leighs Construction and Naylor Love. Such an attempt to standardise contractor management systems should be applauded, and will go some way to minimising confusion and inconsistency. Businesses should also be taking their own steps to ensure they have the correct systems in place. Investing in an automated health and safety platform, with a dedicated contractor management component, will help streamline and simplify this process. An automated platform will allow you to connect with contractors, sub-contractors and other PCBUs in real-time – sharing information on training and licenses, personal protective equipment, insurance documents and the like. Such a system is invaluable for ensuring you understand the potential risk contractors bring to your site, and provides the tools to manage their qualifications and competencies for allocated tasks. If we agree this is how it should work, rather than, “well, that would be nice, but (insert excuses here)”, then how do we get this engagement with contractors? Educational thinking prior to the 1980s would have said stick and now they’d say carrot. I think you need to start with the carrot of building an ‘us’ culture, one that shows you care about their staff and well-being on your sites – it shouldn’t be too hard to reach common ground around that. We want all parties to see the benefits of being part of the team, and if that doesn’t work then the stick can come out. Not the ‘stick’ of Roald Dahl’s headmaster characters (read Boy if you want this in graphic detail), but the one that sees them not being considered for contracts due to non-compliance, or a poor record on previous jobs. Assura’s health and safety software will capture the pre-qualification information of your contractors and in-field service operators, including the company’s compliance material, its licenses and staff competencies. Contractors can also login securely to relevant parts of the system, giving them clear accountability. It is their responsibility to provide relevant and up-to-date information, and they will also be reminded of when they need to take action. The goal here is to use the technology to reach the many different parties working on one job at the same time, and empowering them with the tools to do the job safely. The Greater Wellington Regional Council is a great example of this – using Assura’s automated health and safety software to manage more than 500 staff, subcontractors and stakeholders working throughout the region. Read more about how we worked together to develop a solution. It’s also important to remember that an effective contractor management system should be configured to your business and its unique set of hazards. It should also make reporting and recording incidents quick and easy for all involved – particularly when dealing with multiple supply chains. 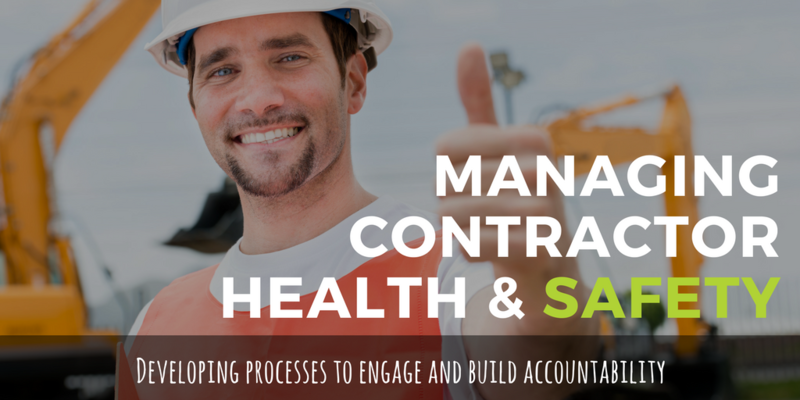 Contractor management doesn’t have to be complex, but you do need a good way for both parties to engage and be accountable. Talk to us about how we can simplify the process and help you go beyond ticking the legal compliance box to improving accountability and achieving a sustained change in culture.